Ever since I was little, I’ve absolutely loved Halloween. I’d plan my costume months ahead, spend weekends making decorations for our house and map out my trick-or-treating route to score the best candy. A big part of getting into the Halloween spirit has always been watching scary movies before the big day. But I know not all Halloween enthusiasts are created equal, (for instance, I’m not big on horror movies) so I thought I’d share my top spooky film picks for different types of film fans to enjoy this Halloween. What it’s about: Bette Midler, Sarah Jessica Parker and Kathy Najimy star as witches resurrected on Halloween night, 300 years after death. It’s up to two teenagers, a young girl and an immortal cat to end the witches’ reign of terror. Why you’ll love it: One word: nostalgia. Chances are you watched this movie as a kid, or with a kid, in the 90s. This film can be enjoyed by anyone; It has jokes and references for adults that kids don’t even pick up on. The witches are hilarious as they play off each other’s personalities, and it’s fun to watch them try to understand the modern world. What it’s about: A regular day at the station for a radio host in Pontypool, Ontario, is interrupted by reports of a virus that turns people into zombies. He tries to warn his listeners, and discovers how the virus is transmitted. Why you’ll love it: This homegrown film puts you in the shoes of radio host Grant Mazzy, and tension builds as the threat creeps closer to the station. It’s one of those films where the scariest part is not seeing the monster for most of it – you never know when it’s coming. The film is especially good because it offers an original take on the zombie film. Hint: the virus doesn’t spread the usual way. What it’s about: Geena Davis and Alec Baldwin star as a deceased couple haunted by a living family that moves into their house. They enlist the help of another ghost, Beetlejuice, to help scare away the family. Why you’ll love it: All of Tim Burton’s creepiest creations come to life in this star-studded twist on the haunted house story. Michael Keaton is amazing as the wacky, high-energy Beetlejuice, as he tries to accomplish his own agenda. What it’s about: A documentary crew offers a look into the lives of ancient vampire flatmates navigating everyday life in the modern world. Why you’ll love it: This one is especially for Flight of the Conchords fans, or anyone who loves deadpan humour. Just try not to laugh when Jermaine Clement confronts his vampire flatmate for not completing tasks on the chore wheel. The entire film is hilariously ridiculous. What it’s about: A newly engaged couple’s car breaks down, forcing them to spend the night at the residence of Dr. Frank-N-Furter. Why you’ll love it: You can get silly along with the cast. The music is what makes this cult classic so much fun; Highlights include performances by Tim Curry and Meatloaf. You’ll be doing the Time Warp in no time! What it’s about: Residents of a worn-down Iranian city encounter a vampire who preys on men who disrespect women. Why you’ll love it: Okay, so this one looks a bit scary for me and I haven’t seen it yet. But I love the idea of changing the vampire film so that the seemingly vulnerable woman is no longer the victim. I’m making it my Halloween resolution this year to watch it! P.S. 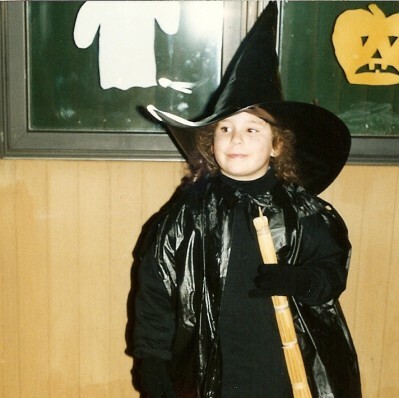 The photo on the left is six-year-old me at Halloween with some of the decorations I made.